the UM, to start, is very different from the map list. a few basic changes are that you now have no ninjas-people who can steal your kill and get away with no hope of retaliation-if someone is lucky enough to steal a kill up here, they cant hide from you!!! you are also competing against players around you and are concentrated on a certain area, like your territory. there are a few strategies as to how you want to start out, but it depends on your situation. if you are by a bunch of people, it is best to claim only a few outposts and work on upgrading those. if you are out by yourself, it may be best to grow stronger and focus on gaining resources faster and wait for the people to come to you. a few problems you will face compared to your real base is protection from large scale attacks such as a PPX wave or a nuke. do not worry, there are more cost-effective ways to take over a base, so you will have gained in the end from this if you attack using only monsters and/or small catapult usage. another major issue is a lack of walls. these bases use their walls in the best way possible, which is to surround and path the monsters at an inner scale. surrounding the outpost and then surrounding defensive buildings is the smartest way to go if you want to help path the monsters. even if you build a cheap outpost and you build small RGs and lvl 1 towers (meaning you didnt buy a starter kit) this is still effective. 90% damage on an outpost means it is destroyed and you are free to take over it. blocks are used in the same manner. basically, defensive tactics are still that of a base. make sure to keep towers so they are not easily twigged (like putting a tesla and laser together). attacking outposts (especially newer ones) are not like attacking bases at all. why? there is no need to use high amount of catapults or any big and expensive monsters to take an outpost down in 2 attacks. what i have found while testing is that groups of fangs work extremely well. why? they have a good health compared to the towers that they are up against, and they can destroy all of the “other” buildings pretty well and fast enough. whatever monsters you use, it is important to spread them out. why? because outposts are smaller, and the towers have a greater range compared to the size of the outposts than does a base. picture this. on a base, you want to send your monsters from 1 direction, so you are able to knock down more with less shooting at you. on an outpost, the range of the tower will cover the entire base anyway, so it makes sense to spread them out so 1. splashes are not as effective, and 2. booby traps. booby traps- after the attack has ended, do not wait for the monsters to unearth booby traps while attacking like you would while attacking a base. why? because you dont want to have to rebuild them. cycling: taking over an outpost and then recycling it: taking over an outpost and then recycling it is a very annoying attack method. it has been discouraged to the point where, now, recycling outpost buildings only give you 25% of the buildings actual worth, unlike the usual 50%. cycling multiple outposts creates a “dead zone” and it remains to be seen as to how people will strategically use these. currently, you cannot recycle the main outpost building (the same as the town hall) because it is free to build+ a blank outpost means that it cannot be damaged=well then, how do you do 90%?? = dividing by 0. +2M for each additional outpost. do not worry, outposts gain +2 million storage for you, so it is possible to keep expanding without buying improved packing skills. Q. does improved packing skills add to the extra storage from taking over outposts? taking over and expanding in large amounts is highly discouraged because of this. buying starter kits was implimented because of the need to build outposts faster + less annoying clicking. when you buy a starter kit, the buildings still take a length of time to build; however, you have damage protection. your worker is still available at the time of buildng outposts. question for developer/someone who knows. considering it costs -2 million of your total storage (without IPS) to get an outpost at a certain level, are the possibilities of buying a mega super awesome starter kit diminished? has anyone been able to buy a starter kit, and if so, at what time, and are you able to at a higher level with IPS? as you can see from the table, you cannot ever in a point in time take over a base and purchase a mega starter kit at the same time. decorations: it says “coming soon”. the debate im sure is whether you place a decoration on an outpost, taking it over results in attacker keeping it?? Q. if i recycle my town hall on my main base, can i still build on my outposts? Q. can the outpost building be upgraded? it is NEVER worth it to simply nuke an outpost. why? first of all, its a mini-base, and it does not require a massive army to take it down. you never realize how long it takes to regain the resources you just threw away. remember, if you destroy an outpost/wild monster base, you need to pay to take it over and you need to pay to get a starter kit. even if you are just going with the small, it will still cost around 4 million twigs/ pebbles, 2.5 mil putty, and 2.5 million goo for monsters). that is expensive, so nuking (especially against a player who can retaliate) is foolish. you need 90% of a wild monster base destroyed to take it over, not simply the town hall like in the list. –remember for looting kozu, that everyone near you can loot the just as well. make sure you attack and get the resources before they do! Q. do wild monster bases still repair? it is possible to attack a yard with more than the usual housing limit with outposts. you are able to fling in monsters from your main base and your outposts in the same attack. however, you cannot attack with multiple catapults. Q. can i take over a main base? Q. do mushrooms grow on my outposts? 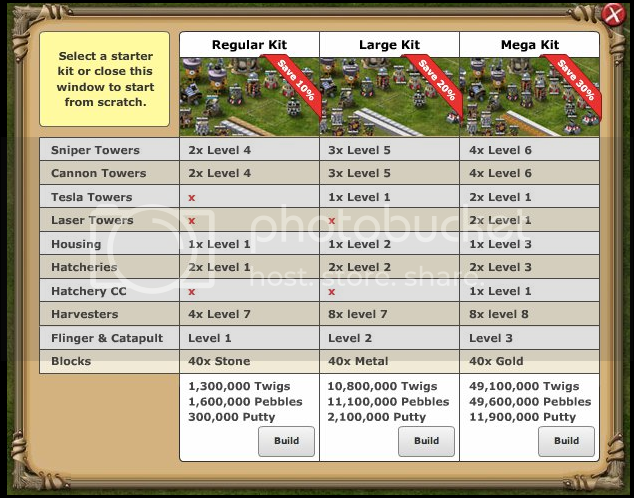 -upgrading/building buildings (including starter kit buildings) do not count until they are fully built. -lvl 1 list users cannot make this leaderboard. elevation can be useful in many ways. first of all, if you are deciding which wild monster yard to take over, and you arent near anyone in attack range, look at the advantage in resource production. if you are deciding to take an outpost from someone who will retaliate, it may be best to take the one with a greater tower range, because it will be harder for them to take back. can you attack with monsters directly from the outpost? before i upgraded my map room i use to fight different people n i cud attack some of my friends as well, um where r they now? so they higher the elevation the farther the tower range? I still dont understand the recycle for outposts, if u recycle, U cant recycle the town hall? so then can the outpost still be taken back from you by the original holder?